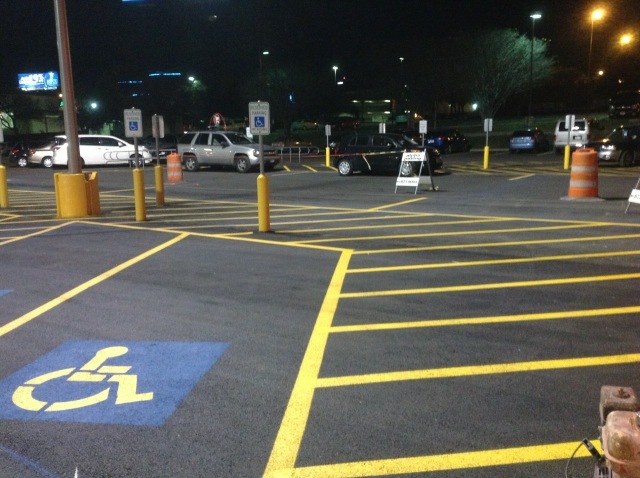 If you own an asphalt parking lot in Austin TX – no matter how small or how large – you know all too well what a difference new parking lot striping can make. After all, your parking lot is the first thing your customers or potential tenants see when they approach your property. If your apartment parking lot is damaged, with barely visible striping, just imagine what potential tenants think the inside of your apartments must be like. If your shopping mall parking lot is in disrepair, with hard-to-see striping, you could actually be losing customers who’ll have a bad first impression and take their business elsewhere. Fortunately, there is one relatively easy way to improve the condition of your property. Even if you can’t afford entirely new pavement, chances are you can afford to have your existing parking lot repaired and have a new coat of striping added. You’ll be amazed at the difference and so will your potential tenants or customers! Whether it’s striping or any other type of repair, it’s important to choose a contractor you can rely on to do the very best job possible. At Bennett Paving, our trained paving specialists have over 15 years of combined experience in the industry. We’re proud to offer our customers the very highest quality work – work that’s done on time and within budget. Don’t trust your property’s striping job to a contractor with little or no experience. Instead, choose Bennett Paving and rest assured that your asphalt striping or repair work will be done right the first time! Most of us understand the importance of choosing a local contractor. We want to support our local economy and make sure that the businesses in our communities succeed and thrive. But when it comes to asphalt maintenance and repair, there’s an even more compelling reason to choose a local professional striping contractor in like Bennett Paving. Asphalt surfaces are susceptible to damage from weather, including extreme heat, torrential rains and even occasional freezing temperatures. Because of this, it’s vital that your contractor understand what the Austin climate is like so they can recommend the most appropriate repair and maintenance schedule to keep your parking lot looking like new for years to come. At Bennett Paving, we’re proud to live and work in the Central Texas area. Not only do we have our business here, but we’re raising our families here just like you. So when it comes to understanding Central Texas weather, we’re experts! We can easily assess your particular situation and recommend what’s best to keep your blacktop in “like-new” condition. It’s a fact of life – we all have budgets. At Bennett Paving, we understand exactly what it’s like to have to live within a budget. And we know how important that is to our customers as well, which is why we do everything in our power to make sure our prices are fair and reasonable. Call us today for a free parking lot striping estimate in Austin!